On October 27, 2007 in the midst of cold, rain and wind the dedication of the Lincoln Statue in Peekskill, NY took place. The weather could not discourage the 200-plus observers and participants from gathering at the restored Lincoln Depot Museum for the event. The statue, a life-sized figure of Lincoln as he spoke to the Peekskill crowd on February 19, 1861, was designed and created by well-known sculptor Richard Masloski. The statue stands on a magnificent block of solid black granite and towers over anyone near it. On hand to participate in the ceremony were many elected officials and key contributors to the effort. 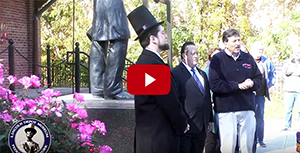 Mayor John Testa presided over the festivities and explained the importance of the Lincoln legacy in Peekskill and its influence on the City and the creation of the Lincoln Society in Peekskill. Also speaking were former Governor George Pataki who helped to provide the grant funding to restore the depot structure and establish the historic site; Harold Holzer, the famous and influential Lincoln Scholar who added a true sense of history and significance to the event; Martin Ginsburg, of Ginsburg Development Corporation, who generously provided the entire funding for the statue, and artist Richard Masloski, who provided an overview of his creative process behind the statue. Also on hand were State Assemblywoman Sandy Galef, County Legislator George Oros, Governor Pataki’s wife Libby, Deputy Mayor Cathy Pisani, other local officials and many members of the Lincoln Society in Peekskill. To cap off the day’s festivities a special presentation was made by Mayor Testa and Richard Masloski to former Governor Pataki and Martin Ginsburg. In a show of appreciation for their support and contributions to the Lincoln Depot and Lincoln Statue projects, both were presented with a gift of a 3’ bronze miniature of the Lincoln Statue.